Want to improve your odds in a fight and get a great workout at the same time? Here’s the deal–Your odds of winning any confrontation can be significantly increased by avoiding a good portion of the punches being thrown. It is also important to successfully absorb the ones you can’t avoid. A lot of guys train hard to dish out a beating, but don’t consider the portion of a fight where you need to take a beating without going down. It should come as no surprise that one of the best ways to defend yourself in any fight, is to ensure that your body is capable of protecting itself. This means that you must be flexible, quick, strong, and your weakest links (neck, internal organs, etc.) should all be protected by a wall of well-conditioned muscle. Today, Frédéric Delavier and Michael Gundill will not only instruct you how to transform your body image to something you can be proud of, but also improve your odds in any fight. This is an excerpt from Delavier’s Mixed Martial Arts Anatomy (materials and photos provided by Human Kinetics). Do 3 to 5 circuits of 20 to 30 repetitions with no rest time between exercises. Do this workout 2 or 3 times each week. This is an isolation exercise for the muscles at the back of the neck. These muscles (splenius) give a boxer’s neck its characteristic shape. They help you to avoid getting knocked out when you are hit in the head. Stand or kneel, intertwine your fingers, and put your hands behind the upper part of your head (1). Use the strength in your neck to push your hands backward as far as possible (2). 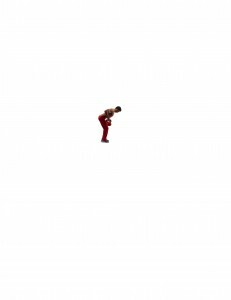 Hold this position for 5 seconds and squeeze your muscles as hard as you can. Slowly bring your head forward using your hands as you resist with your neck. Do not push your head too far down in the stretched position. It is best if your chin does not go much past the point where it is parallel to the floor. You can do neck extensions and neck flexion exercises in a superset with no breaks in between. 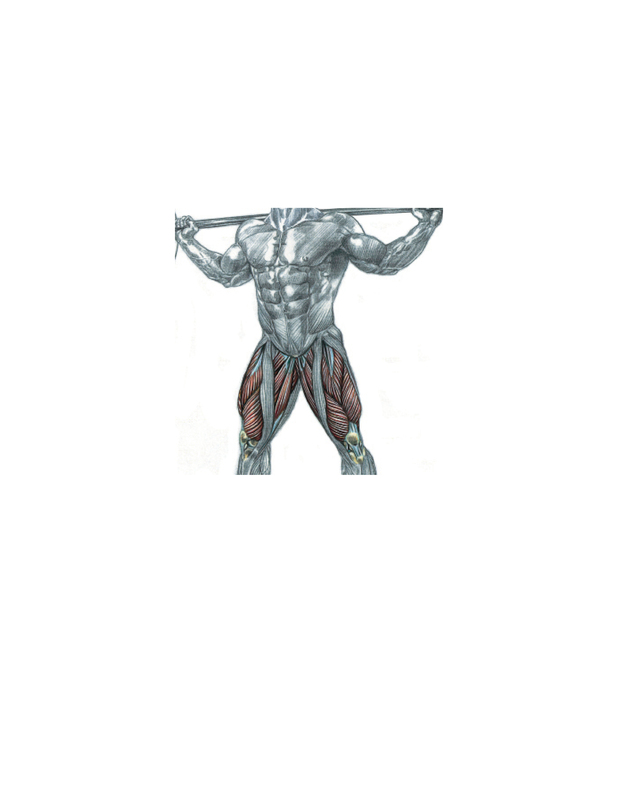 This isolation exercise works the entire abdominal wall isometrically. Lie on the floor facedown, and support yourself on your elbows and toes (push-up position). Keep your body as straight as possible, and hold this static position for at least 30 seconds (1). If you have trouble putting your palms on the floor, make fists and put your hands in a neutral position (with only the pinkies touching the floor). If the weight of your head becomes too uncomfortable, bend your neck forward so your head rests on your hands. A yoga mat will help prevent discomfort in your forearms. A. To increase the difficulty of this exercise, a partner can place a weight plate on your buttocks or sit on you. In this case, be very careful not to arch your back. B. If you do this exercise in a side position, you can focus the work on your obliques. If this variation is too difficult at first, put your free hand on the floor for support. This stabilization exercise requires no equipment or material, and you can do it in very little time. Among fighters, it could become a friendly competition to see who can hold the position the longest. For the reasons mentioned at the beginning of this section, static work should never be the only way in which you work the abdominal wall. If you have never done strength training, it is important to start with a total-body strengthening program so you can quickly increase your muscle strength. You should start with general strength training techniques so you can learn to perform basic exercises properly, position your back correctly, and breathe properly. These programs are not customized for fighting, but they are easier than specific strength training programs. You have to learn to walk before you can run; it will keep you from stumbling! Once you have mastered basic technique, choose one of the customized fighting programs so you can develop strength, speed, power, and endurance. Do this program 1 or 2 times each week for 1 month. This is a compound exercise for the lumbar region, latissimus dorsi, arms, buttocks, thighs, and calves. The shoulders also work very hard in the version where you lift your arms above your head. Weightlifters call that variation a clean and press. ★ This is the most complete exercise that exists because all the muscles in the body participate. ★ Even though this exercise is not specifically for fighting, the lifting part gives beginners the critical total-body strength required for dominating with strength in hand-to-hand fighting. Bend over so you can pick up two dumbbells that are next to your feet. Keep your back flat or arched very slightly (1). Use a natural hand grip—semipronated (thumbs forward and turned slightly toward each other) is ideal. Push with your legs and pull with your back to stand up (2). Synchronize your leg and back movements as much as possible (3). Once you are almost standing up, use your momentum to bend your arms (hands almost pronated) (4) and bring the weights to shoulder level (5). From there, lower the weights and lean forward as you bend your legs to return to the starting position. Be sure to warm up very well before using heavy weights. Your warm-up should not only prepare your muscles but also condition you for the technical execution of the exercise. Keep your head very straight and gaze slightly upward. Most important, avoid looking left or right because that could make you lose your balance and result in a back injury. A. For a more complete exercise that recruits the shoulders and triceps, you can straighten your arms above your head to perform the clean using full range of motion. This is a more complex variation is not recommended for beginners who have less than three months of experience in strength training. B. Weightlifters often use a long bar in this exercise. However, this variation provides rigidity and symmetry in the exercise that you will never experience in a fight. The clean works all the major muscle groups in a short time. Not only does it work the muscles; it also helps improve motor coordination. Since you can do the exercise explosively, it creates a lot of power. When you do it in long sets, it is also excellent for increasing muscular endurance. This is a very technical exercise. It requires a certain amount of time to learn how to do it and to gain muscle mastery. 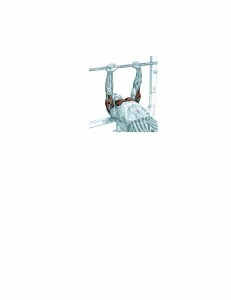 This is a compound exercise for the triceps, chest, and shoulders. Lie on a bench made for bench presses or in a squat rack. Use a pronated grip (thumbs facing each other) and grab the bar with your hands about as wide as you normally punch (1). If you use a wider grip, you will get stronger, of course, but the muscle work will not correlate with the strikes you throw in a fight (since you rarely punch toward the outside). Lower the bar to your chest and then lift it up powerfully to straighten your arms. The narrower your grip and the farther out you place your elbows; the more you will work your triceps. (or even longer) before you straighten your arms. This rhythm of muscle contraction is closer to what you experience in a fight, and it will allow you to use heavier weights. B. The partial narrow-grip bench press, which consists of just the upper phase of the exercise (close to a complete extension of the arms), targets the triceps even more than a full bench press. This variation works on direct blows, such as hammer fists. In this case, the power of the strike primarily comes from the strength in the triceps. These strikes are similar to a triceps extension, and doing partial narrow work will make you stronger in that exercise as well. C. To train yourself to hit an opponent who is shorter than you, or to hit him once he is on the ground, use a bench with a slight decline. E. Performing the exercise partially to better target the serratus muscle. D. To train yourself to hit an opponent who is taller than you or to improve your uppercuts, use a slightly inclined bench. E. The narrow grip can be used in push-ups. Their major advantage over the bench press is that the shoulder blades are not immobilized on a bench. This forces the serratus anterior muscles to get involved in order to stabilize the shoulder blades. The serratus muscles also help project the arms forward, so theses muscles can increase the power of your punches. To isolate the serratus anterior, or when you have reached fatigue doing push-ups, do a partial movement with straight arms by sinking down and making your shoulder blades stick out. F. Instead of using a bench, put a padded cushion on the floor to get a slight elevation. This will let you push more with your thighs. Here, the goal is to mimic a defensive position when your back is on the floor. To make this exercise harder, squeeze a medicine ball between your legs during the set so that you also work your thighs. In fact, even on the floor, your arms work together with your legs. This exercise is not specifically for fighters, but it is useful if you are just beginning strength training. It will help you quickly gain strength in your torso muscles. People rarely hit with both arms at the same time and especially not with the shoulder blades immobilized by a bench. Once you get stronger from doing narrow grip, you should move on to an exercise that is specifically for fighting, which we describe next. This is a compound exercise for the quadriceps, buttocks, hamstrings, low back, and calves. 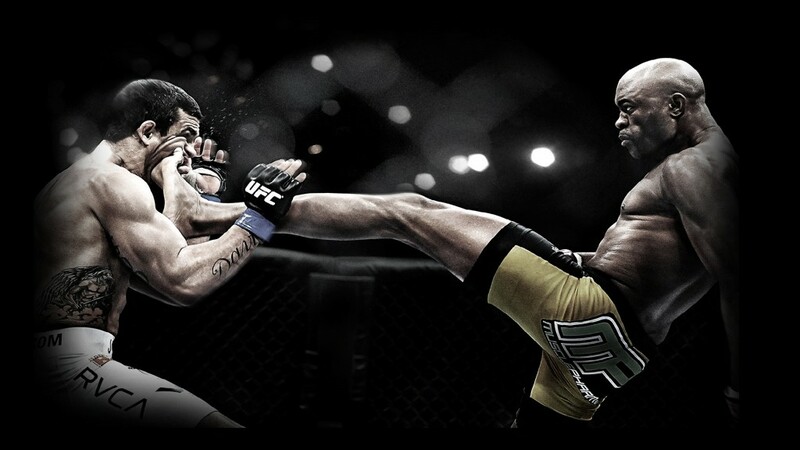 ★ The thigh muscles play an important part in anchoring your body during a punch. ★ Squats will increase the power of your thrust during Superman punches or jumping knee kicks. ★ Doing heavy squats will help you push your opponent with more force during hand-to-hand fighting while standing up. You can use your strength to push your opponent backward. ★ By working the buttocks and hamstrings, squats improve your spinning kicks and stomp kicks. With your feet a bit narrower than shoulder-width apart, put a bar on the back of your shoulders (not on your neck). Keep your back flat and very slightly arched backward. Take one or two steps backward to get out of the rack. Keep your back as straight as possible and bend your legs. Go down 8 to 10 inches and then push through your legs until your legs are straight once again (1). There is no point in trying to go down too low. The goal is to use as heavy a weight as possible over the usual range of motion that your thighs experience during a fight. The squat works the entire lower body in a very short time. The longer your legs are, the more dangerous it is for your back to go down low. An awkward leg-to-torso ratio will make you bend very far forward, creating instability in your low back. 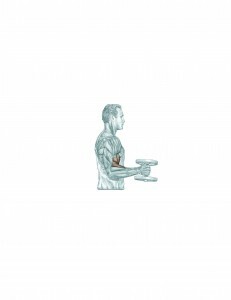 This isolation exercise works all the forearm flexors: biceps, brachialis, and brachioradialis. The focus should be on the contraction as well as the static phase of the exercise. Grab a dumbbell with your hand in the neutral position (thumb pointing up). Bend your arm and keep your thumb pointing up (1). Lift the dumbbell as high as possible. To do this, you can pull your elbow back slightly, but be careful not to move it too much. Hold the contraction for 5 seconds. Slowly lower to the starting position. A. You can do this exercise while standing or sitting (to work as if you were fighting on the ground). With both hands at the same time. By lifting one arm and then the other to alternate repetitions. Using only one arm for an entire set. When your thumbs face the outside, the biceps will intervene more in the exercise. When your thumbs face the inside, the brachioradialis will work more and the biceps will work less. This is a compound exercise that focuses on all the back muscles as well as the biceps, forearms, and thighs. ★ This exercise is similar to the position in hand-to-hand fighting where you stand up and lean forward in order to pick up or flip over an opponent who is on the ground. ★ This exercise will also give you the necessary strength to knock an opponent off balance by pulling him toward you when you are both standing up during a fight. Lean forward so that your torso forms a 90- to 145-degree angle to the floor. Grab two dumbbells or kettlebells with a neutral grip (thumbs forward) (1). Pull with your arms and bring your elbows up as high as possible (2). Squeeze your shoulder blades together before you lower the weights. As a general rule, you should pull the dumbbells up to your navel. Some people like to bring the weights a little higher toward the chest and others a little lower, near the thighs. In the same way, for hand positions, some people prefer to have the thumbs slightly turned in and others like them slightly turned out. Choose the position that most closely matches what you encounter in your fighting discipline. Keep your head high, especially during the contraction phase of the exercise. Do not turn your head from left to right. Kneeling variation is a variation specifically for ground fighting. It involves moving or lifting an opponent who is lying on the ground while you are on your knees and in side control. In this position, lean forward and grab one or two dumbbells from in front of you to do the rowing exercise. Between each repetition, let go of the dumbbell for 1 second before starting the exercise again. When you are on your knees, the difficulty lies in keeping your balance by anchoring your tibia to the floor through a powerful contraction of the quadriceps. To prevent knee discomfort, fold up a towel or a mat and place it on the floor so you can kneel on it. Rowing works all of the muscles used for pulling in a coordinated manner, no matter what position you are in (standing or kneeling). The forward leaning position is very hard on the spine. Can you hear the boom? That’s the sound of your machismo calling. Try these specialized circuits, and discover the quiet confidence in being prepared to roll with the punches, no matter who’s delving them out. 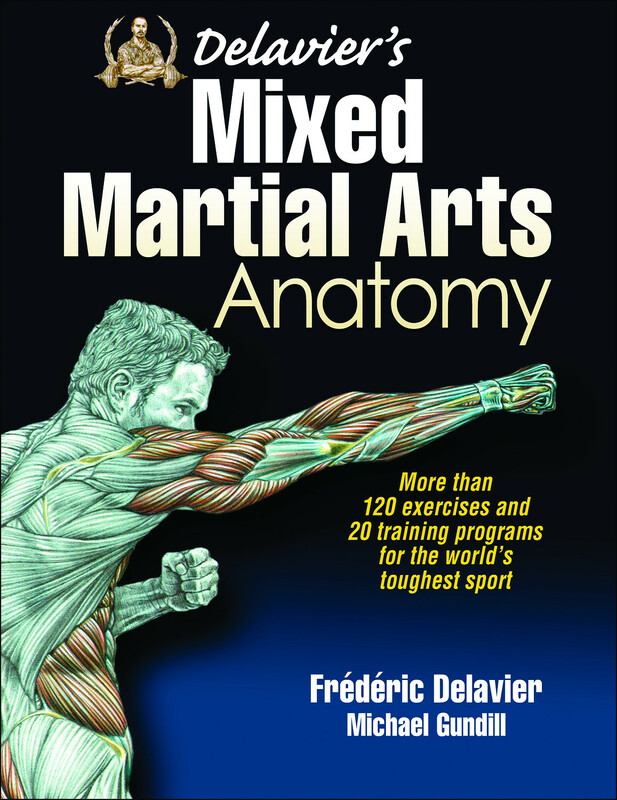 Delavier’s Mixed Martial Arts Anatomy is written by Frédéric Delavier, whose legendary book Strength Training Anatomy has sold more than a million copies worldwide. 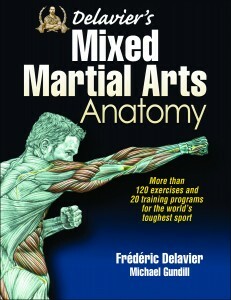 Co-written with Michael Gundill, Delavier’s Mixed Martial Arts Anatomy is now available at Amazon , bookstores everywhere, and online at HumanKinetics.com. 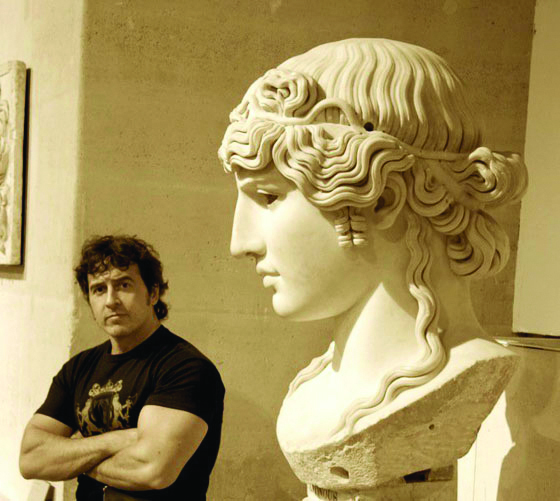 Frédéric Delavier is a gifted artist with an exceptional knowledge of human anatomy applied to sports. He studied morphology and anatomy through numerous dissections at the Medical University of Paris. 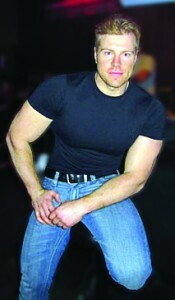 He is the author of the worldwide best-selling Strength Training Anatomy and Strength Training Anatomy Workout 1 and 2. Michael Gundill, MBA, has written 13 books on strength training, sport nutrition, and health. He has written over 500 articles for bodybuilding and fitness magazines around the world, including Iron Man and Dirty Dieting. In 1998 he won the Article of the Year award at the Fourth Academy of Bodybuilding Fitness & Sports Awards in California. With Frédéric he wrote Delavier’s Core Training Anatomy and Delavier’s Stretching Anatomy.